The City Year group works tirelessly to bridge the gap in high-poverty communities between the support the students in the communities actually need, and what their schools are designed to provide. In doing so, they help to increase graduation rates and change the lives of the students that they serve. In Boston, City Year is led by a group of dedicated and inspiring professionals who are committed to ensuring that City Year makes significant impact in helping students who are at risk stay on track to graduate on time. To do this, City Year Boston deploys 265 highly skilled AmeriCorps members to serve in 21 elementary, middle and high schools, positively impacting nearly 10,000 students. City Group Boston’s leadership is comprised of business professionals, community leaders, and devoted alumni. Support from the Boston community is critical to the continued success of City Group Boston and CMBG3 Law is proud to support City Group Boston. 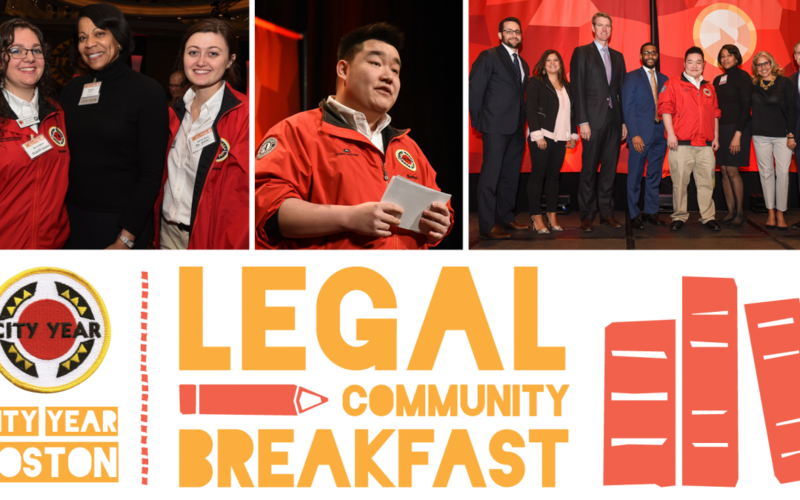 Our team participated in City Group’s Legal Community Breakfast on March 3, 2017, during which community leaders came together to discuss ways to continue to support City Group Boston’s efforts in the Boston community and beyond. CMBG3 Law looks forward to continuing to support City Group Boston. If you would like to discuss our involvement with City Group Boston or ways that you can help, please do not hesitate to contact us at 617-936-4353.